6 keys to warding off premature death. 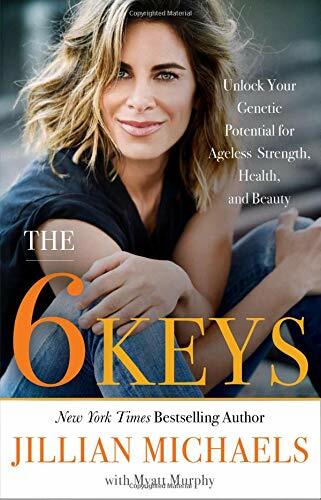 JILLIAN MICHAELS: Aging is a subject matter that for no good reason seems to be shrouded in all kinds of mystery. And the reality is that there is nothing in our genes that tells us to age or tells us to die. So we naturally have to ask then why do we? And it appears that there are six hallmarks of aging, six body processes that are responsible for how we age and they can work for us or they can work against us. And how we live is what determines the outcome of those results. So the first key, this is kind of how we've listed them, myself and my cool author Myatt Murphy who is fantastic, is stress, stress adaptation. So when we think of stress we often think stress is evil, stress is the devil, it's so bad, but in reality stress is designed to make us stronger, whether it's emotionally or physically, like we can be literal here. Somebody has osteoporosis or osteopenia, their bone density is becoming compromised with old age. Well, why do we recommend working out, in particular with weights? The idea is that stress is an injury, we're injuring the muscles, we're enjoying the bones, stress with regard to fitness in this particular case, and it creates these little micro fissures in the bone. Well of the body, we jump to our second key, which is inflammation, has an inflammatory response, sends in bone cells and says all right whoa we've got to heal this, we've got to get all this back together. The bone remodels and becomes more dense. So again, stress when properly managed, be it emotional or physical, is designed to either make you wiser, smarter, stronger, more depth, more empathy or your bones become more dense, your muscles become leaner and stronger. And when you look at all of the amazing things that our body does to adapt to stress you see that it's there to make you better. The second being inflammation. So without inflammation you couldn't cure the common cold. However, when information becomes chronic, just like stress you've got this little army of white blood cells are like we've got to go to war with somebody, well when the key of inflammation becomes ongoing and chronic it starts to attack healthy tissue. This is when you get into issues like rheumatoid arthritis, for example, a perfect example. Another big one is metabolism. We're looking at a body process in particular called autophagy. So autophagy is really where our body goes in and culls dead cells. It's like the garbage trucks come in, they break down the old and they rebuild the new. When we're eating constantly, so food timing is very important, and not only that but how much we eat is very important. So when we consume food we've got to break it down, we oxidize the food, which creates oxidative stress. So okay the less food we eat, within reason we're not trying to starve ourselves, but we also don't want to eat too much food and we put this in a place of what I call calorie restriction. So calorie surplus you're at a healthy weight and you're eating more than you burn in a day, that's too much food we need to restrict that and match calories in with calories out so it's the simple law of thermodynamics. And unless you have weight to lose we don't want to get into calorie deprivation because now we're starving the body. So unless we have fat stores or stored energy, that process of autophagy where we cull the dead cells, turns on healthy tissue and go after healthy bone, healthy muscle and so on. So food timing of eating every three to four hours, breakfast, lunch, snack, dinner in particular, and creating a 12 to 16 hour window of fasting. Fasting not to be confused with starvation. And it has become synonymous with that concept these five two diets and days of eating 500 calories, that's not what fasting is. Fasting is a period of your day where you're not eating. It actually has nothing to do with how much you re eating, that thermal dynamics and that's what we just talked about with calorie restriction. So that 12 to 16 hour period is really optimizing your body's ability to, A, not focus on oxidizing food and free itself up energetically speaking to focus on other things like boosting your immune system for example, culling those dead cells through autophagy. And in addition it's less oxidative stress because you're not eating all day long and you're not eating as much so just one example on the third key. Another one, telomeres, the length of our telomeres. So our telomeres are those little caps at the end of our chromosomes and every time our DNA replicates itself we shave off just a little bit of those telomeres. Well, when the telomeres are gone our chromosomes can fuse together, you can get genetic abnormalities and that can build up over the years and cause a host of health related issues. In addition this is how we start to see things like gray hair because our pigment cells start to die. Telomeres super, super, super important key and you have your epigenetics or your epigenome. So people say this is genetic. This is all a genetic. What is? The way your genetics express themselves is fluid. It's not static it's a dynamic and, of course, it is effected by the way we live, but what's most responsible for that expression is your epigenome. So your epigenome is kind of like that overbearing parent so if all of our cells share the same genetic information what's telling this cell to become a bone cell or that cell to become an immunity cell and so on? Well, that's your epigenome. And what's choking off certain parts of your DNA and loosening up on others saying okay express this component, choke off that component and we can make this work for better or for worse. And in fact studies are showing us that our epigenome is actually effecting what we're passing off to our offspring. So, there was this study on Holocaust survivors and it was found that their offspring, their children have a better resistance or more resilience to emotional stress. So again, this can be a super wonderful fantastic thing just like all the keys can really work for us and make us the best version of ourselves for years and years to come, or conversely they can predispose us to cancer and what have you. And here's another perfect example of what the epigenome can do and how we can make it work for us, when we say muscle has memory, it's true. It's your epigenome that's remembering and marking your muscles so to speak so that when you start training again your body gets in shape more quickly. So it's easier to get back in shape than it is to get in shape the first time. Moving on to our macromolecules, which is our cells, the health of our cells. how our cells are communicating with one another, how they're duplicating and so on. But our cells are literally our macromolecules are made up of proteins, fats, carbohydrates and nucleic acids. Macronutrients, protein, fat, carbs, macromolecules made up of the same things so that should be a foreshadow that any diet seeking to remove a macronutrient is inherently horrible for you. Getting older is inevitable. But with diet, exercise, and some insight into how the human body works, you can do your best to keep your body from aging prematurely. Meal timing, combined with 12 hours of fasting, can actually do more for your body than you might realize. Did you know stress can literally alter your DNA? And did you know that biological ways to combat the stress can even be passed down to your kids?